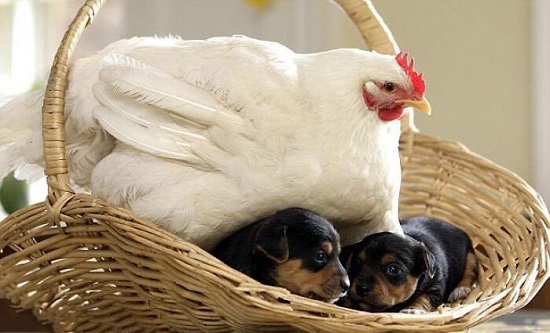 A chicken sitting on two puppies to protect them as if they are her babies. Image source. 1. The Bible is literature for the resistance (posted July 12) "And so the Bible honors women like Shiphrah and Puah, the Hebrew midwives who defied the Pharaoh’s orders by safely delivering the sons of Hebrew slaves, and Shadrach, Meshach and Abednego, who essentially “took a knee” by refusing to show the required patriotism at one of King Nebuchadnezzar’s state parades." Preach. 2. This sun-chasing robot looks after the plant on its head (posted July 12) Adorable! 3. What Reporting Sexual Harassment Taught Me (posted July 9) [content note: sexual harassment, victims being re-victimized when reporting] "These questions convey the message that we should only report incidents that were traumatic, and only if we’re sure that the harasser deserves dire consequences. This is part of a broader pattern of holding people who report sexual harassment to an impossible standard." 4. Film Theory: Can You SUE a Superhero? (Disney Pixar's The Incredibles) (posted June 19) "Clearly this timeline isn't an accident on the part of Pixar." 6. Trump’s Spiritual Advisor Calls Babies Smuggled into the U.S. “Sinful” (posted July 16) What Paula White did here is called taking the Lord's name in vain. Related: If y'all aren't already reading Libby Anne's blog, you should. All her recent posts about immigration, politics, and Christianity are very good.